I CAN HEAR THEM NOW, sizzling in the cast iron skillet, the colorful mix of New England apples (you should be able to find good McIntosh, Cortland, Empire, or Honeycrisp at this time of year) glistening in melted butter, soon to grace our brunch table. The contrast between the fluffy meringue and soft apples is exquisite. This elegant and delicious dish comes together and bakes quickly, making it a favorite around here. Note: If you start up slow in the morning as I do, you can core and slice the apples the night before, drizzle lemon juice over them to reduce browning, cover them with plastic wrap, and refrigerate. Preheat oven to 450°. 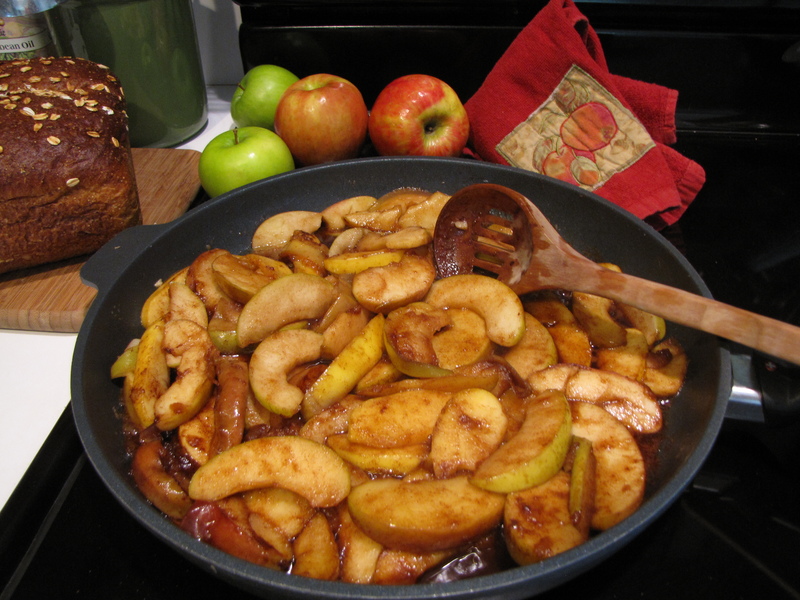 In a large, heavy skillet on low heat, sauté apples in melted butter until slightly softened, about 5 minutes. Sprinkle the brown sugar and cinnamon over apples and sauté 10 more minutes, until caramelized. 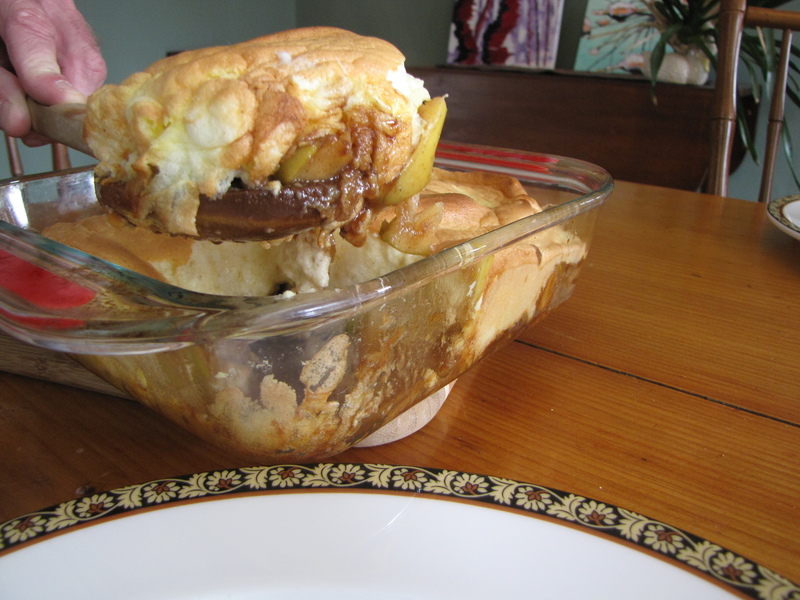 Spoon mixture into 8″ x 8″ square baking dish and keep warm in oven. Separate the egg yolks into a small bowl, and the whites into a large bowl. Whisk yolks with the sugar until thick. Beat the whites with cream of tartar until stiff. Fold into yolk mixture. Pour egg mixture over apples. Bake 8-10 minutes until puffy and golden. Sprinkle with confectioners’ sugar and serve immediately. FOR NEW ENGLAND APPLE GROWERS, finding people to pick their crop is neither easy nor cheap, and the process plays out in offices across the nation. Farmers start by paying $1,000 or more seeking domestic employees with help-wanted advertisements. Add in $500 in annual fees, $325 for each application, and another $1,000 per worker in recruitment and travel costs. That’s more than $2,800 up front to hire a single worker, before you factor in wages and housing costs. Meanwhile, paperwork with the U.S. Department of Labor must be filed two months before the farmer anticipates that the crop will be ready for picking, the first of several key administrative steps before a farm can be approved for hiring. If there are no snags, the farmer eventually is certified to bring in foreign workers through the federal H2A temporary agricultural program. The H2A workers must be paid $10.25 per hour — three dollars more than the current U.S. minimum wage — and provided with free housing. (U.S. workers are paid the same $10.25 agricultural rate for doing similar work.) In addition to being a major expense, the process is so complex that most growers hire an agent to administer it, such as the New England Apple Council (NEAC), in Goffstown, New Hampshire. The NEAC was started to process foreign agricultural workers in the early 1960s, when a group of about 20 apple growers were having trouble getting harvest workers and decided to band together. Today, the council has about 200 active members, who use from one to 75 workers. (At one time, the council worked on behalf of one tobacco grower who hired and housed 735 workers.) About 75 farms now use just one or two workers. The council expects to handle about 425 applications this year, meaning that almost every farm has two different dates of need (DON), requiring separate applications. About 80 percent of the H2A workers are from Mexico, with about 10 percent from Jamaica. The rest are from other Caribbean and Central American countries. Growers must file a job order for U.S. workers with their state’s workforce agency at least 60 days before their DON. After their application for H2A workers has been accepted and no less than 45 days before DON, paperwork for foreign workers needs to be filed with the U.S. Department of Labor in Chicago. If no, or not enough, U.S. workers are found, the farmer is certified to bring in foreign workers 30 days before DON. This certification is added to a Petition for a Nonimmigrant Worker and filed at federal immigration offices in California. After the petition is approved, workers are recruited, visas are obtained, and travel arrangements are made to get workers to the farm. If everything goes well, the process takes 65 days from the beginning to having workers on the farm. The U.S. Department of Labor fees are $100 per farm, plus $10 per worker. Immigration fees are $325 for each application. Recruitment and transportation costs are about $1,000 per worker from Jamaica (less if workers come from Mexico). If a farmer uses the New England Apple Council, they need to pay annual dues of $400. Two ads locally and two or three out-of-state can cost as much as $1,500. In addition to their hourly wage, H2A workers are provided with free housing, transportation, and subsistence (a per diem for meals to and from the farm), all paid by the farmer. Jamaican workers can elect to have savings, health insurance, and Jamaican Social Security deducted from their pay, but it is voluntary. H2A workers are subject to U.S. income taxes as nonresident aliens, but they are exempt from Social Security, so there is no employer match. Housing must be inspected before certification is issued by the U.S. Department of Labor, following federal Occupational Safety and Health Administration (OSHA) regulations. Massachusetts also has its own state licensing requirements. About 65 percent of H2A workers are here for six months or more. The other 35 percent are in New England only for the fresh apple harvest. Workers can legally stay and move from one H2A job to another for up to three years, but no one contract can be more than 10 months. Only a few workers transfer to jobs in other parts of the country. In the past, the New England Apple Council transferred a number of workers from tobacco to apples, but now most tobacco growers either no longer employ H2A workers or else they keep them for a longer time, as late as November, so they are not available to harvest apples. Almost all H2A workers are home for at least two months each year.